I’m trying to get a handle on a family where the youngster is never present. The parents’ daytime resting time is almost always in close proximity to each other, either in an open field or under cover of some forest edge habitat. Even when I can’t see them, I can tell they are fairly close together because when a siren whizzes by, they respond by yipping which reveals their proximate locations. It’s hard to tell what’s going on with the youngster — and with the parental relationship with him — because I seldom see the youngster. Until today. Today I watched this youngster out in the unhidden open. What a rare treat! He did not immediately flee to the underbrush the minute he saw a person (me), but rather allowed me to spend time observing. He just sat there and looked around from his safe-zone in the far distance where I know he stays, but this time he wasn’t concealed behind bushes and thickets. Soon he got up to go: he stretched and yawned, and obviously was at ease, even though a person was observing him. He looked at me, but basically went about his business. He casually walked off, and then started descending a hill when suddenly he stopped cold, did a quick about-face, and headed up the hill in a hurry, lickety-split. He stopped to look back once and then disappeared over the crest of the hill. I looked down the hill to find out what he might be running from and was surprised to see his father staring at him. Hmmm. Instead of running towards each other for a happy greeting, the youngster was running away with trepidation! Father glaring over his shoulder, up the hill, at his youngster. Youngster hurries away. Had there been an altercation earlier? Might one of these coyotes have secretly taken and reburied a food cash that belonged to the other? Might there have been an issue with insubordination? Might lessons about territoriality and not crossing boundaries have been involved, or even safety issues about remaining away from dogs? Might the firm establishment of a hierarchical order be involved? Or, highly unlikely, might this have been the beginnings of an early dispersal process? I’ve never seen a coyote dispersed under one year of age here in San Francisco, but I’ve heard it alluded to. The bullying that precedes dispersal may go on for months before the youngster decides to take off for a better life elsewhere. I’m sad that I haven’t been able to see coyote family behaviors from this distant fella. We’ll see what happens. going, going, they’re GONE! — without incident! This gal was in a field hunting when some late visitors to her park arrived with their dogs. Some of the dogs were leashed and some were not. Most unleashed dogs chase after coyotes, though some do not — they did not this time. Some of the dogs have chased her in the past and she remembers each and every chase and chaser. She waited, anticipating the worst, but it didn’t happen this time. On this day, coexistence worked really well here in San Francisco. Both photographs are of my LA county pup following Mom around. Both were alarmed when they saw my companions, another human and two good sized dogs, and me. Mom headed down the road and within a minute her puppy followed. The road offered us a clear view of them, but for only parts of the way because brush along the road at times concealed them from view. Soon both coyotes were hidden. Yet Mom could have immediately hid with her puppy in the brush. Why didn’t she? I think she had decided it was to her advantage to use the road strategically. When Mom took to the road, I didn’t know if she intended to approach or avoid. I think she knew that by taking to the road, I wouldn’t know where she would end up or whether she intended to come towards me or intended to go away. All I would really know was that she was on the move. After dusk, Mom came out from hiding to sit and stare at us, her puppy still in the brush. A third coyote, Dad, came in and out of view near them. Together, Mom and Dad formed a stone wall against an intrusion. Then, apparently instantly oblivious to danger, the puppy decided to come out and join Mom. Mom got up and the puppy followed her back into the brush. The puppy is too young to know that Mom doesn’t want to play when actively guarding the family. Here in Los Angeles County my coyotes see me before I see them. Once I noticed Mom in the distance observing me. Once I looked up to see a yearling watching me. Dad also kept the pressure on me, seeing me first about every other day. I received their attention despite trying a new tactic. Typically I walk east to get to watching places. Saturday I instead went north along the eastern boundary of my coyotes’ field. Along the east is a fenced off structure that has only a couple places where I can see into their field. Unfortunately, they too can see me. I hoped they wouldn’t see me. As I happily walked, Holtz was ahead of me. Then he turned to come back. Immediately he started adversarially stalking towards something to my rear. Holtz’s head was slung low, protruding with his tough guy gaze fixed on the other side of the fence. I grabbed him and turned around. I expected to see a dog with a walker. I saw nothing. It must have been a coyote, no doubt one of mine that had been tailing us. Compared to a few months ago, my coyotes are visible and active. 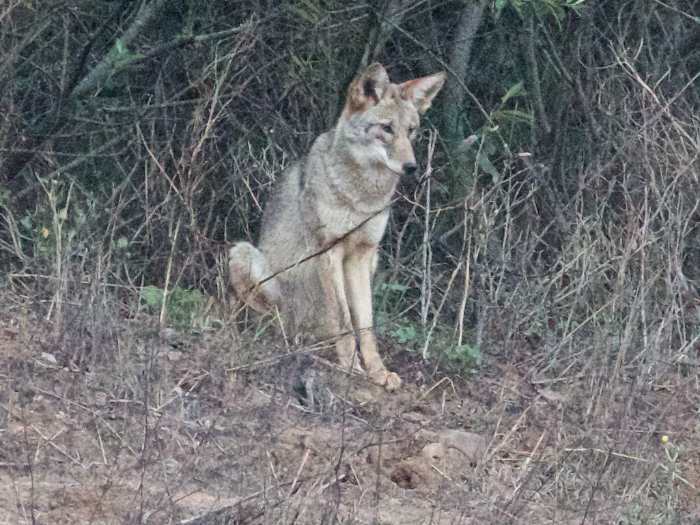 Coyotes with puppies are more active for a couple of reasons. First, they are alert for interlopers. Coyotes hide and protect their young and are vigilant for all possible dangers. Also, they hunt more for having more mouths to feed. Fortunately for coyotes, nature provides them with more to hunt during spring. This time of year, my coyotes’ rabbits also produce offspring. 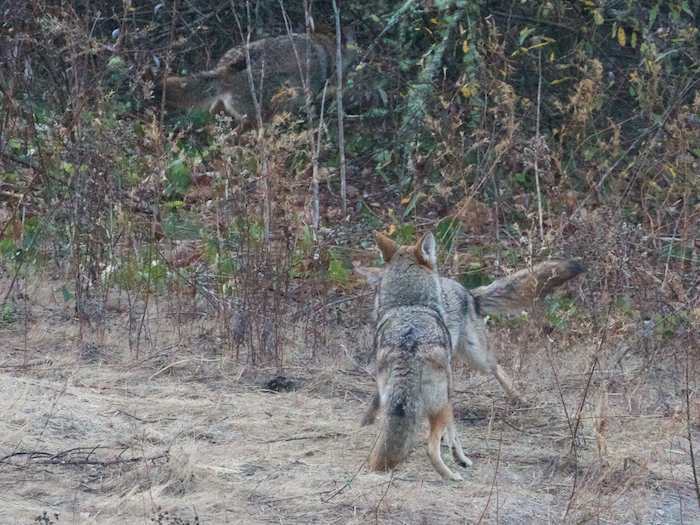 Controlling rabbit populations is an important coyote job. Young rabbits are easier to catch than adult rabbits, and I imagine that in good years there are lots of them for adult and child coyote alike. The richness of vegetation from good rains provides more cover for rabbit nests. Rabbit nests would be fairly easy for a foraging a coyote puppy to find all on its own. Yet the coyotes and other predators don’t find all the nests. One reason they don’t is that adult rabbits make themselves conspicuous this time of year, acting as fast running decoys that lead predators away from their nests. Dense ground cover with a bumper rabbit crop in their field is an excellent incentive for my coyotes to remain in their field. A balance between predators and rabbits protects the field itself from a being overgrazed by rabbits. Fifteen years ago, when I would only see foxes, rabbits were a problem down river at Leisure World which suffered from a rabbit invasion. I suspect that since the coming of coyotes, that invasion silently went away along with the foxes. I came upon the pair early — curled up as little fur balls in an open field. They watched me but stayed where they were for about 5 minutes. Then, one got up and trotted off. When he came to a rock, he climbed up to look back at the other coyote. She had not budged — maybe she wasn’t coming? He continued down a trail. I noted where he went and returned to observe the female who had remained behind. She eventually got up and stretched — slowly and deliberately — and then disappeared down a ravine, where I could no longer see or follow her. She had not gone in the same direction that the first one went. So I hurried along the trail taken by the first coyote, the male, and I caught up with him just as the female emerged from some bushes and joined him. They came together in an area that was a congregating place for dogs. Both coyotes began meandering about, sniffing out the area and urinating/marking wherever they found a smell, which was everywhere. Occasionally one would watch the other or they would look at each other: they were in sync about this purposeful “marking”. When this job was completed, they looked at each other, reading each other’s cues, and then began trotting down a path away from the area. The coyotes had not gone far, when, over the crest of a hill, there appeared a runner with his small leashed dog. The coyotes quickly skedaddled off the path into hiding. The runner saw them and ignored them and continued his run. 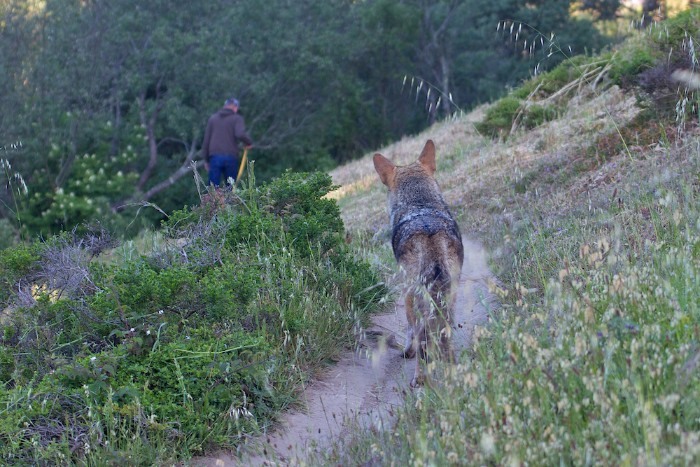 But the coyotes did not ignore him and his dog — they had been unexpectedly surprised by him. It seemed that now they wanted to be more careful, so they watched. They also, repeatedly, exchanged glances with each other — this is their way of communicating and gathering as much information about how the other was reacting to the situation. And then they moved to an even more hidden area behind bushes where they sat or lay down for a while. Not until ten minutes had elapsed did they slowly venture back to the dog area. 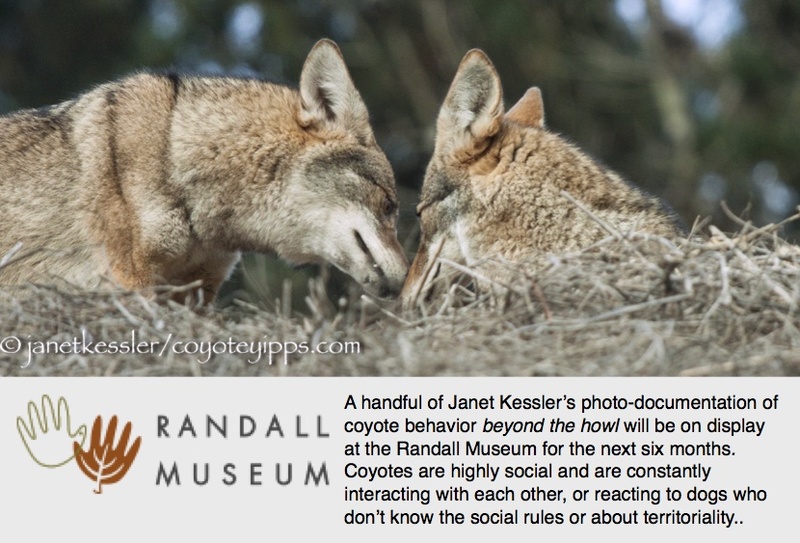 The male coyote was bolder than the female about this. He went first, sniffed around and urinated some more, this time on a tennis ball. The female then descended from her hiding place and did the same. Slowly the duo moved in a new direction, up a hill with no path. They kept looking at each other — they were constantly in tune to the subtle cues of danger or boldness from the other. Again, the male went first. The female followed, stopping for a sip of water on the way. While up on the hillside another walker with an unleashed dog began walking by. The owner saw the coyotes and leashed his dog immediately. The coyotes were far enough away so that they did not flee, but they stood very still and watched quietly until the dog and walker had moved on. They then continued their trek up the hill. One of them headed to a high rock for a sweeping look around. The female went to a much lower rock where she curled up comfortably to watch the activity below. There was almost no activity. This inactivity didn’t last long because another unexpected runner, no dog this time, came around a bend close enough to make the coyotes bolt up and run off, out of view. The runner was pleased to have seen them — excited that she had seen two coyotes. 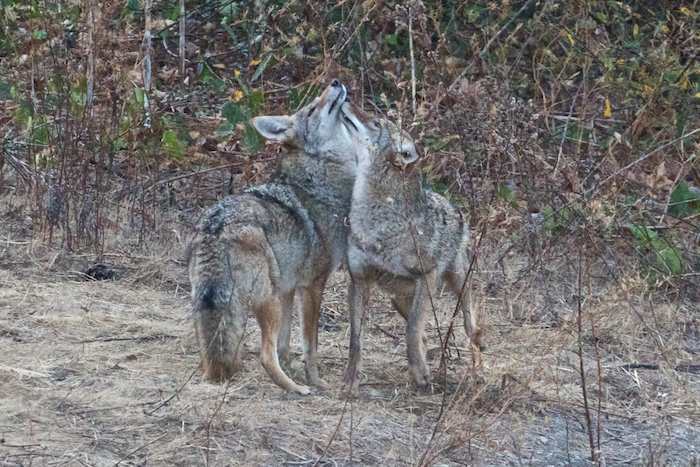 When she was out of sight, both coyotes reappeared, began sniffing and urinating as before, and then continued their trek up the hill until a large group of dogs and walkers could be seen approaching in the distance. The female disappeared into the brush quickly, but the male went up to a little knoll and sat down to watch this group from the distance. While he was there, he became distracted by a flower and ate it, all the time watching the dogs with their walkers who were also very interested in the coyote: there was mutual curiosity and respect. When the coast had been clear for a while, this coyote descended the hill, and that is when the female reappeared and again joined him. They both sniffed and marked a number of times in various places. Sometimes the female would mark, and the male would immediately smell and mark the same spot right after her. They continued their descent, stopping to view a few dog walkers in the far distance, and stopping to sniff and mark on their way. They ended their outing by heading into a thicket. I knew I would not see them any more that day.